Shumai,also called pork dumplings (although oftentimes other types of dumplings could also be filled with pork), is a type of traditional Chinese dumplings served in dim sum. 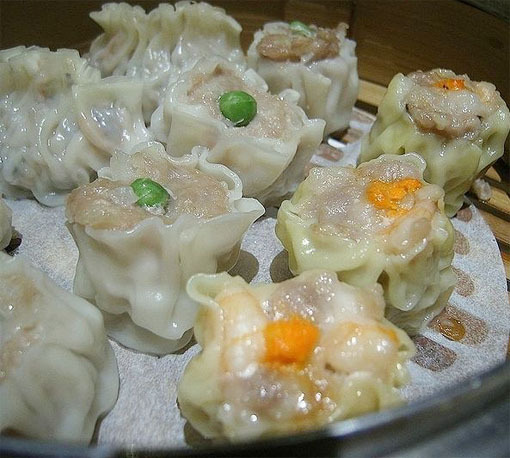 Many varieties have been created as the shaomai was gradually introduced to all provinces, where it was adapted to the different regional tastes throughout China. 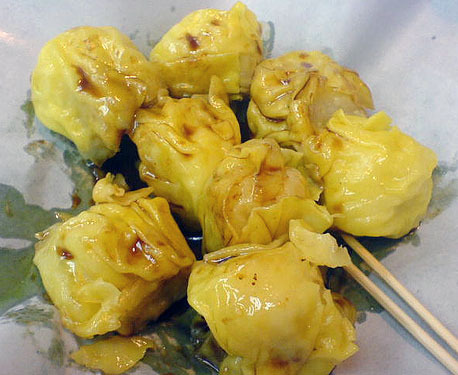 However, most people in Western countries associate shaomai only with the Cantonese version due to the Cantonese diaspora. Huhhot Shaomai is a regional variety in Huhhot, Inner Mongolia. It is one of the oldest varieties of Shaomai and can be considered the origin of Shaomai. The wrapping is a very thin, round sheet of unleavened dough, with a pleat border. There is only one kind of filling, consisting mainly of chopped or minced mutton, welsh onion and ginger. Huhhot Shaomai features its excessive use of welsh onion and ginger, creating a dense combined scent, and a slight spicy taste. The filling is put in the center of the wrapping and the border of the wrapping is loosely gathered above, forming a "neck" and a flower shaped top. Huhhot Shaomai is commonly served with vinegar and tea, due to its greasiness. This is the most well-known variety from the south-eastern province of Guangdong. 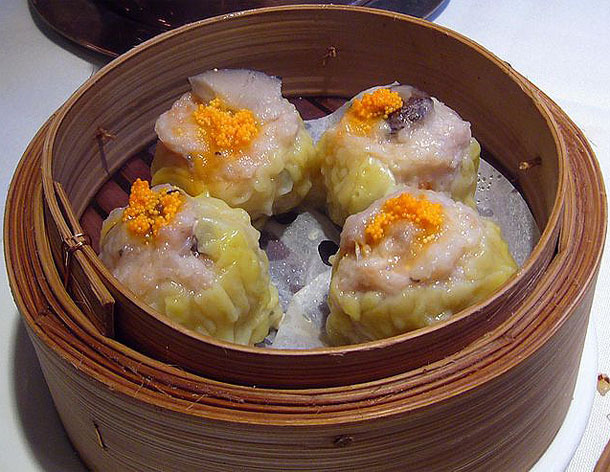 As prepared in Cantonese cuisine, siumai is also referred to as "pork and mushroom dumpling." Its standard filling consisting primarily of ground pork, small whole or chopped shrimp, Chinese black mushroom, green onion (also called scallion) and ginger with seasonings of Chinese rice wine eg Shaoxing rice wine, soy sauce, sesame oil and chicken stock. Bamboo shoots, water chestnuts and pepper can also be added. The outer covering is made of a thin sheet of lye water dough. The center is usually garnished with an orange dot, made of crab roe or diced carrot, although a green dot made with a pea may be used. The decorative presentations vary. This variety is made in Changsha, Hunan (province neighbouring Guangdong). This shaomai is named so, due to its opening resembling the chrysanthemum flower petal shape with the egg-yolk. It is spicy with pepper and the wrapper is translucent. Filling largely consists of glutinous rice, pork hash, shrimp, Chinese mushroom (otherwise known as shiitake) bamboo shoots and onion. marinated pork pieces in glutinous rice and steamed with pork fat. It is larger in size than the Cantonese version. along with green onion and radish, whereas the southern filling primarily uses glutinous rice with smaller amounts of mutton or beef. Minced meat from sheep ribs containing some fat is ideal. 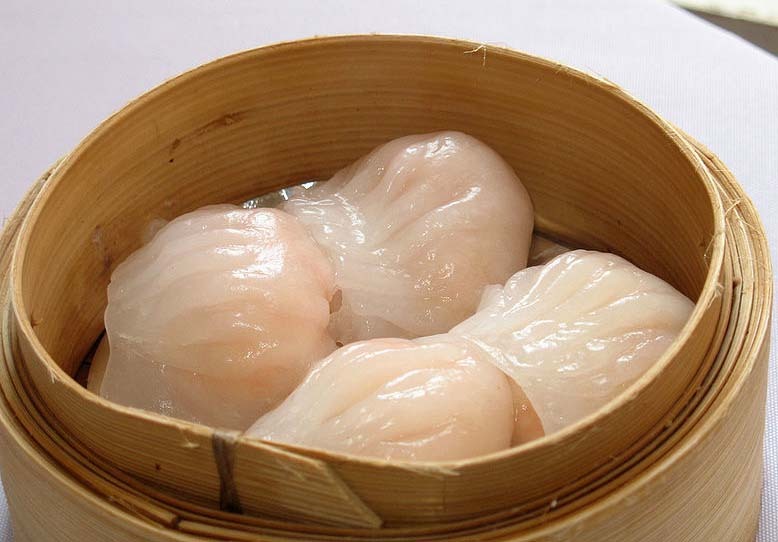 It is called the Yifeng shaomai in the south-eastern Jiangxi province. Its distinct flavour comes from a blend of pork mince, bread flour, sesame seed powder, ground pepper and sugar. It is particularly popular in the area of​​ Yifeng Tanshan Tianbao where it is one of the foods eaten during the Chinese New Year celebration.